Harley has been going for swimming lessons for a few months now, and I can’t get over how far she has come. I told you a while back when I reviewed her cool swimming nappy that I would tell you more about the classes themselves, and I feel like I’ve tested them for long enough to give you a detailed and honest assessment. Swimming lessons are quite possibly the best thing I ever could have done for Harley. As we move into summer, I’m sure many of you will be heading to the pool. It’s a great way to cool down, to have fun as a family, and with the current water restrictions it can even help cut down on bath times. But I’m sure plenty of you are a bit nervous about your little ones in the water – when is it safe to start them swimming and how do you introduce them to the water, let along teach them how to swim? Well, thanks to the swimming lessons at Aqua Marine Aquatics Academy, not only is Harley doing well with all those things, but I also feel confident to hang out with her in the water. Water safety is a big deal. Every year, so many kids drown simply because they fall in the pool, wander to a lake or are swept away by the tide. It’s so sad and scary to think about, especially because of how fast it can happen. Now that Harley is sorta mobile, I know what it’s like to have your kid playing in one area, only to look away for a moment and find them in a totally different area. And with water, it can be so dangerous. It only takes a moment for a child to fall into a pool, and if they aren’t rescued within a few moments, the consequences can be dire. Just imagine you’re at a friend’s house, hanging out by the pool, cooking up some steaks on the grill. You go inside to get refills for people’s drinks, and one of the other moms pops off for a quick pee. The guys are so absorbed in the act of cooking meat on a fire that they don’t even hear the quiet splash as your little one falls into the pool. By the time you are back out with the drinks, your little one could be in pretty bad shape. It sounds like fear mongering, but it’s a very real and very possible scenario, but also very preventable. Part of the lessons Harley goes to include learning how to float on her back, how to grab onto the side, how to cope in the event that she falls into the pool. It’s something that I hope she never has to use, but it helps to give me so much peace of mind that if she were to fall into a body of water, she would know how to cope until she could be rescued. And it’s not just in the event of those scary things – she is also learning basic rules about water safety, like how to get in and out of the pool, and not to run around the edge of the pool or other things kids do that can make me crazy. I am thoroughly intrigued by all things early childhood education. I’m convinced that the more I can do with Harley now to help her understand the world, the better off she will be as she grows up. I’m doing things to improve her future sense of direction, her physical and mental development, and working towards helping both side of her brain and body work together. It’s not that kids who don’t get all those things will somehow be unable to thrive, but I figure every little bit helps make her life better and easier as she grows up. And swimming is good for all those things. There is the curious property of water that is so much fun for a baby. It’s a unique texture, and responds differently when you hit it than the floor does. Splashing is a ton of fun for Harley, and it’s something she does in the pool and the bath. In fact, swimming classes have also made our bath times more interesting – we now practice floating on her back, getting her face wet, and even going under water. Through swimming, Harley is learning about movement, about texture, about how her body reacts in water as compared to out of water, as well as mastering some basic safety like holding onto the sides or how to right herself in water. It’s helping with midline crossing as she moves her arms and legs together, and she is also practicing jumping, taking turns and decision making when she chooses a toy each week. You couldn’t be in better hands! Our instructors also go through continuous development workshops throughout the year in order to keep their minds and ideas and teaching methods up to date and keep them inspired. 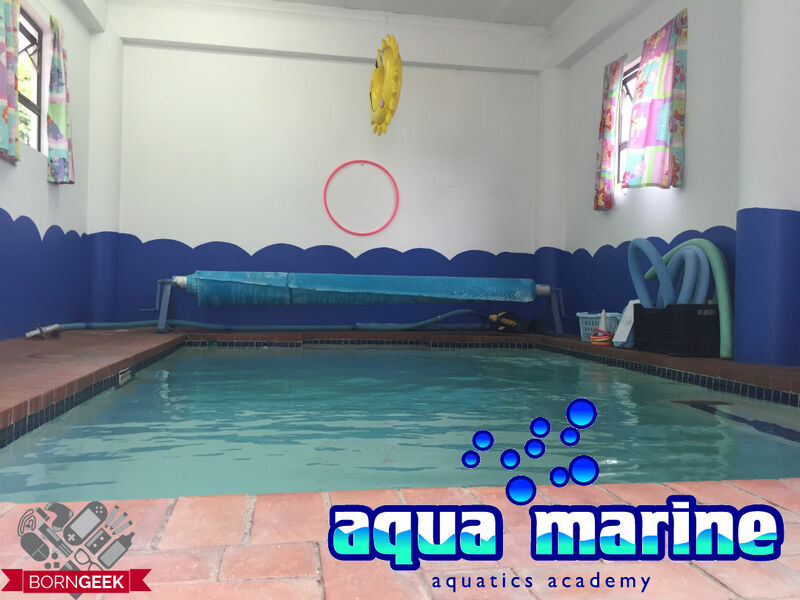 We at Aqua Marine Aquatics Academy offer group classes so that the children can learn from one another, from getting to be quieter and watch how its done, to showing off and being big bold and brave. We work to each child’s strength and abilities in nurturing and developing them to their full potential whilst growing respect for water and a passionate love for all water sports inside them! I think that’s the biggest thing for me. I see Harley is already a water baby, is already so brave and confident, even when going underwater or jumping into the pool. What more could I hope for? Thanks to taking her from such an early age, I know that Harley is safer around the water, and can actually enjoy herself with swimming as she grows up. 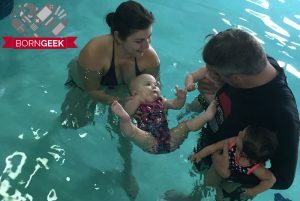 Each parent goes in the water with their kid, learning how to hold and support them as they learn and grow, and there’s a maximum of four babies in a class. And Marc, her teacher, has been so caring, so funny, and so helpful every step of the way – he is both nurturing and courageous, helping us realize just how much our littles ones are capable of in the water. If you live in Johannesburg and are looking for swimming lessons for your little one, Aqua Marine Aquatics Academy has my highest recommendations. After just three months of lessons, Harley has already learned so much, had a great time, and continues to grow each and every week of lessons. Please check out their website and feel free to contact them with any questions – they have worked with a range of kids including young babies and special needs children, as well as lessons for adults and even aqua aerobics (which I’d love to try one of these days). Full disclosure: this is a sponsored post, but if you can’t already tell, I feel really strongly about the importance this class has had for me and for Harley.